An international team of Engineers has created a prototype device with the ability to filter out extremely minute particles from blood samples without the need to send the samples to a lab. The device integrates microfluidic and acoustic cell-sorting technologies, and is considered to be advantageous not only for medical applications but also for scientific research. The system has been developed such that it can isolate “exosomes,” or biological nanoparticles liberated from all possible types of cell in the human body. The exosomes are considered to have a vital role in cell-to-cell communication as well as disease transmission, and hence have been the subject of scientific inquisitiveness from the time they were discovered 30 year earlier. However, the very minute size of the exosomes renders them challenging to be investigated and difficult to be isolated from their intrinsic biological fluids. Prevalent techniques include spinning of the samples inside a centrifuge for many hours or many days, which damages the exosomes by exposing them to very high gravitational forces. 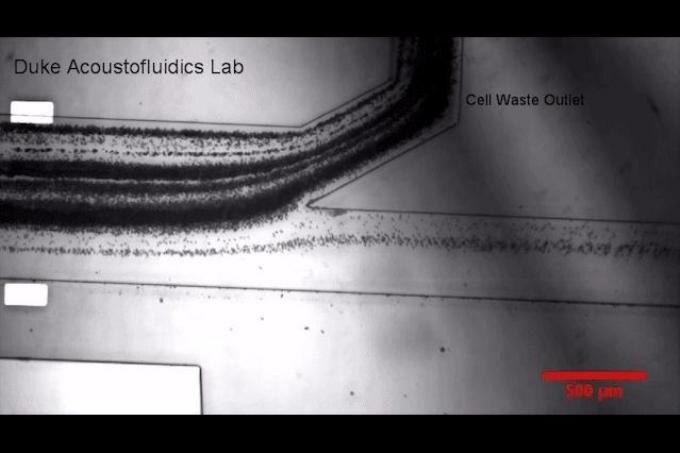 Above all this, the technique captures just a small fragment of the nanoparticles existing in the biological fluid. In a paper published in the Proceedings of the National Academy of Sciences on 18th September 2017, Scientists from Duke University, the University of Pittsburgh and Magee Womens Research Institute, the Massachusetts Institute of Technology, and Nanyang Technological University Singapore have reported on an advanced technique dependent on “acoustofluidics,” an integration of microfluidics and acoustics. The prototype device proves to be an automated, gentle and point-of-care system with the ability to isolate exosomes from whole biological fluids in a single-step, on-chip manner and with a high rate of yield and purity. Exosomes have significant potential in medical diagnosis and treatment, but the current technologies for exosome isolation suffer from drawbacks such as long turnaround time, inconsistency, low yield, contamination and uncertain exosome integrity. This work offers a new technique that can address these issues. We want to make extracting high-quality exosomes as simple as pushing a button and getting the desired samples within 10 minutes. “The capability of this method to separate exosomes without altering their biological or physical characteristics potentially offers new pathways to assess human health as well as the onset and progression of diseases,” stated Subra Suresh, president-designate of Nanyang Technological University Singapore, the 21st Century Professor of Biomechanics in Medicine at the University of Pittsburgh Medical School, and Former President of Carnegie Mellon University, who is the co-corresponding author of the paper. The prototype device developed by Huang and his collaborators generates a high-frequency sound wave that travels at an angle with respect to the liquid flowing down from a tiny tube. Any particle with a size greater than 1000 nm can be pushed into a separate channel by cautiously customizing the frequency and angle of the sound wave with respect to the size of the particles and length of the channel. This separates blood elements such as red blood cells, white blood cells and platelets. Then, the fluid flows through a second chamber in which the same force is applied to filter out all the particles measuring less than 130 nm, a size equal to that of most of the exosomes and 500 times lesser than the thickness of a strand of human hair. The dual-stage method was demonstrated to have the capacity to isolate over 80% of exosomes in the sample at a purity of 98%, as against the prevalent techniques that isolate just 5%-40% of exosomes. The new device can eliminate all blood cells and platelets first before efficiently separating extracellular vesicles such as exosomes. This new generation of integrated device design makes it possible for centrifugation-free sorting of different blood components, which can drastically reduce the cost and processing time involved with liquid biopsy assays.